One of the many things I have learned during our nightly routines is the importance of a good book. Good meaning something I enjoy reading as I am usually on my last ounce of energy, and something that will hold the kids attention as they prepare to fall asleep. Time is precious and there is no need wasting it with a mediocre book. 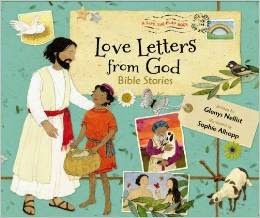 Love Letters from God will not disappoint. We have been reading our way through the twenty stories that span the old and new testaments and I look forward to each one. The pictures are beautiful and the stories speak to the children in a way that is easy to understand while teaching an important lesson. Then comes the love letter. A verse also accompanies the story and is the perfect length for the kids to say along with me and work on memorizing. I wasn't surprised to find out that the author and illustrator both grew up in small English villages. This is the type of book that I'd enjoy reading over a cup of tea with EJ. We may just have to move this up to our afternoon tea time. ZonderKidz provided me with a free copy of this book in exchange for this review which I freely give.